Dogs love nothing more than gobbling up a tasty treat. Treats let your furry friend know that they're being good and act as a scrumptious sign of love. Not only that, but treats are often bursting with enough flavor to keep your pooch's tail wagging well after they've swallowed it. ​While most owners are more than willing to cave in after seeing those adorable puppy dog eyes, it's important to keep their snacking under control. Like humans, dogs can experience unwanted side-effects after eating too many treats. One of the messiest and most uncomfortable is diarrhea. The added flavors and unique ingredients used in many commercial dog treats can wreak havoc on your dog's digestive tract. In moderation, treats will pass through their system with no problem. However, when your dog consumes large quantities, they'll have to pay the price. When it comes to dog treats, there's no exact quantity you shouldn't exceed. There are a number of factors that you should consider when you're rewarding your pup. For one, it's important to remember that not all dog treats are made the same. Manufacturers utilize unique formulas to create treats that are distinct. Some options may have a higher calorie count than others. The key to finding the right balance is to look at the treats as a smaller meal. Instead of worrying about the number of treats you're giving your dog, worry about how those treats are affecting their daily caloric intake. ​​​​In total, treats should make up no more than 10% of their daily diet. It's a good idea to keep track of the treats you're giving them and modify the regular serving size of their main meals accordingly. Take a look at the treat's nutritional value and use that information to determine how many treats you can supply without getting into dangerous territory. You should also consider your dog's size and breed. There are a number of reasons why an abundance of treats may cause your dog to experience diarrhea. Typically, diarrhea can be remedied quickly by simply by removing the irritant. Unfortunately, most owners don't know what causes the stomach condition. Here are some common treat-related factors that can disrupt your pup's digestive system. 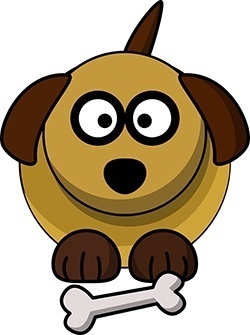 As the name implies, fillers are designed to help your dog feel full and satisfied after eating a treat. They're often used to add bulk to dog foods without adding significant costs to the manufacturing process. Unfortunately, some of the most popular filler ingredients aren't the best for your dog's stomach. Fillers like corn, soy, and wheat are known to cause diarrhea. Dogs aren't equipped to process these ingredients. As a result, your dog's digestive system goes out of whack while they pass through. Furthermore, fillers don't hold much nutritional value. They're basically wasted space that's used to fill the gap where more beneficial ingredients should be. Because there aren't many nutrients to take advantage of, the body doesn't absorb the ingredients. Instead, they stay in the digestive tract until they're excreted. You should always stick with natural ingredients when looking for dog treats. Cheaper treats often contain chemical additives that don't work well with your dog's body. These additives are used to enhance color, add flavor, and prolong the shelf life of the treat. While consuming these treats every so often will pose no significant problem, eating too much may overload your dog's body. It'll have a difficult time processing the ingredients, which then results in uncomfortable diarrhea. When you're shopping for treats, it's important to take a look at the ingredients list. If you find a long list of ingredients that you can't easily identify, the treat will likely cause issues. There are many options on the market that are free of artificial ingredients and utilize natural alternatives to achieve the same effects. Fat is a crucial nutrient that dogs need to stay energized and healthy. Healthy fats can add a boost of savory flavor to a treat and provide your pup with many cosmetic benefits. Treats often have a significant amount of fat in them. They're like junk food for the canine species. All that added fat will turn your dog's normal stool into a runny mess and ultimately lead to weight gain. 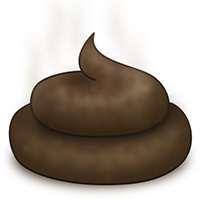 Even if it doesn't get to the point of causing diarrhea, you may notice that the fat causes your dog's poop to be slick and oily. It's important to remember that your dog's standard kibble already has fat in its formula. 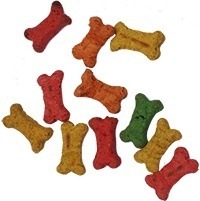 Before you choose a dog treat, take note of the dog food's fat content and find a treat option that complements it. Fat should only make up somewhere between 10% and 15% of your dog's diet each day. One of the most basic and overlooked causes of diarrhea is a sudden change in what your dog's consuming. Dogs are creatures that get used to sticking to their normal routine. They get accustomed to doing the same things and eating the same foods. Have you ever switched kibble formulas and noticed that it upset your dog's stomach? The same principle applies to treats. Usually, your pooch won't have problems consuming treats that contain wildly different ingredients. However, a sudden influx of new treats is a whole different story. It throws off their system and makes it difficult to process the new ingredients. Their digestive tracts are very sensitive and will process the treat ineffectively, resulting in diarrhea. There are many foods that you and your dog can share. Natural fruits and vegetables are easy to come by and provide your pup with an unprocessed boost of nutrition. While these treats are much healthier than commercial options, it's important to stick with the same rules. Fruits and vegetables can actually have a bigger effect on your dog than manufactured treats. This is because dogs don't have the ability to filter out unsavory bits like humans do. Their stomachs may still react unfavorably regardless of how healthy the treat may seem. All in all, treats should be a reward that's given out in moderation. While you may be tempted to provide a treat for every good thing your dog does, too much of a good thing can get pretty messy. New foods should be introduced into your dog's diet slowly to avoid any sudden upsets. Stick to a strict calorie plan and pay close attention to what's going into your dog's body to keep them comfortable and free of stomach pains.